When you sign your marriage license you are also signing up for a “honey-do” list. True story. If you’re anything like me the honey-do list keeps getting bigger and bigger. For one reason or another, I don’t normally get to knock projects off that list in a timely manner. Timing was great for this project though. I recently bought 1,000 board feet of hickory to use for indoor furniture projects. Projects that I had to delay due to the wood not being dry enough. So when my wife asked me to make a small table for our front porch I thought it was a perfect in-between project to knock out. My wife got a small, vine type plant from one of her coworkers that needed a landing spot on our porch. So that’s where the idea for this project came about. Because the table requirement was simple I kept the design simple. The table would reside between two chairs on our porch and with the plant on top. I wanted to make the table big enough so that the plant and maybe an occasional cup would fit on top. Nothing more than that though. Too big and the plant on top would look out of place. Too small and the table would look more like a small stand. For materials I chose to use some of the hickory I previously mentioned. It’s not dry enough to use for larger indoor furniture projects but it’s dry enough to use for a small project that will live outside in our humid climate. My moisture meter was reading 10% on these boards so as long as I build with wood movement in mind there shouldn’t be an issue. 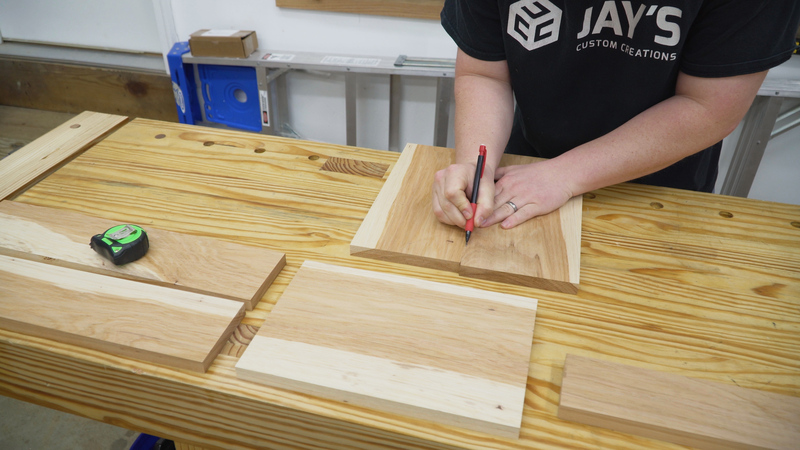 The first step for any project of mine that comes from rough sawn lumber is to do a rough layout on the boards to make sure I match my parts with the grain I want. The miter saw is normally my first tool for every project. Having a dedicated station that is set up to break down lumber quickly is something I really like. 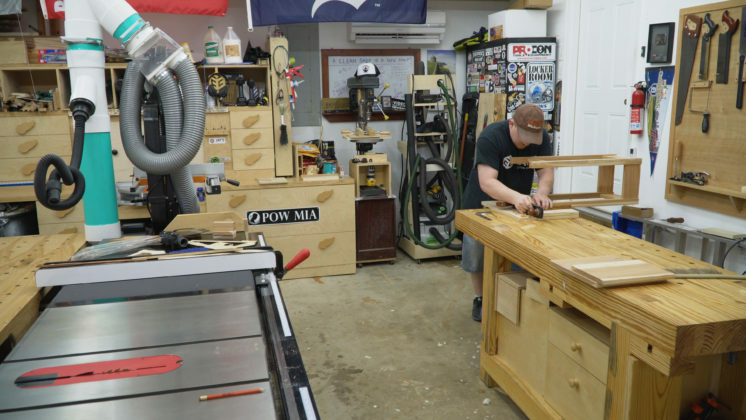 I don’t remember life before building my miter saw station. I’m just kidding…..kinda..
Because I didn’t have material thick enough for the legs I had to make my own blanks by gluing two strips together. 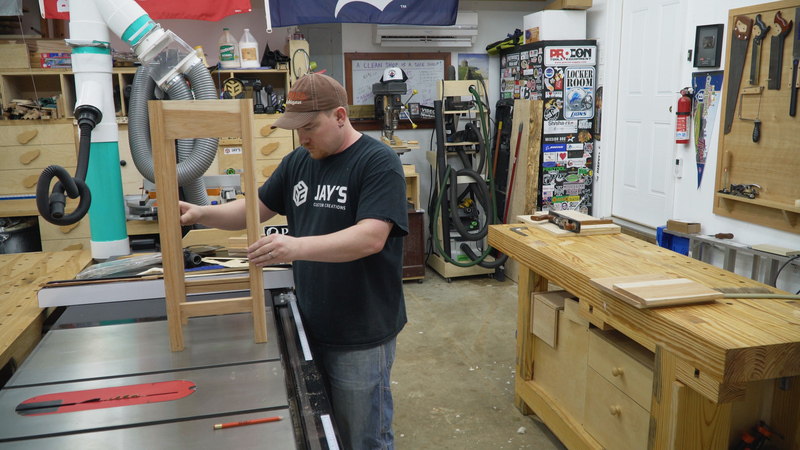 The boards I picked out for the legs was flat enough to rip oversized at the table saw safely. 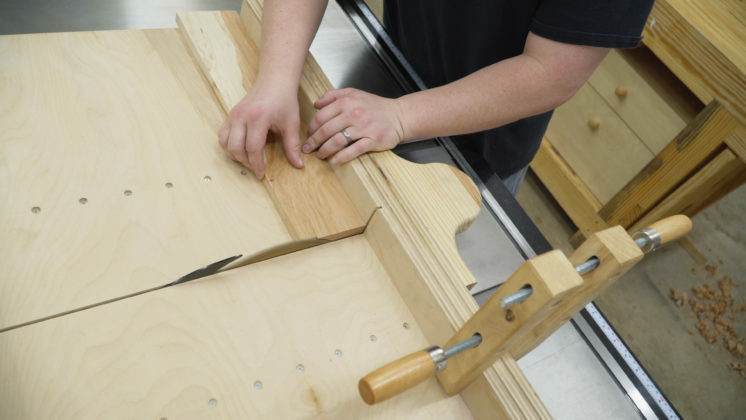 If a board has too much cup, bow, or twist in it the bandsaw is usually the safer option for this task. I didn’t bother with jointing the leg blank boards. They will be jointed after gluing. Instead, each wide face was planed slightly to get a good glue surface. 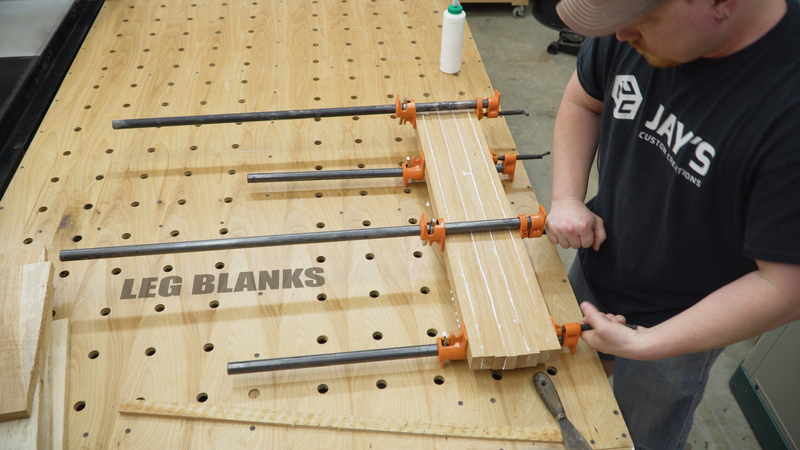 When gluing up blanks like this it’s a good idea to stack the blanks and glue them all at the same time. These pieces had a good grain match pretty much regardless of how I oriented them, which was nice. I didn’t have enough sap wood showing on all of the pieces so I oriented everything to hide as much of it as I could on the legs. 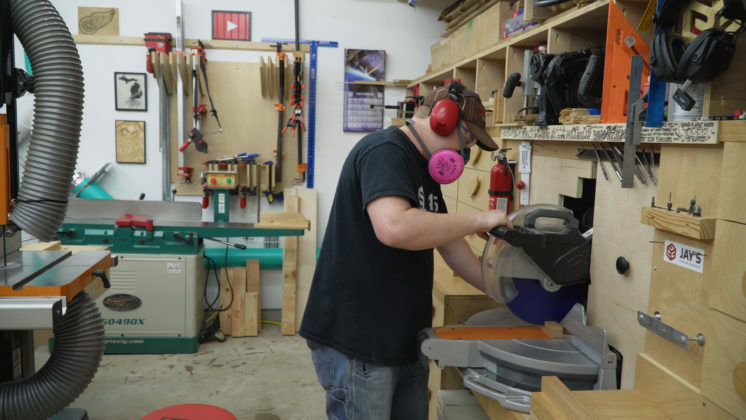 As I previously stated, if a board has too much cup, bow, or twist in it the bandsaw is usually the safer option for rough size ripping. In this picture you can see that the board had a bit of cup to it. 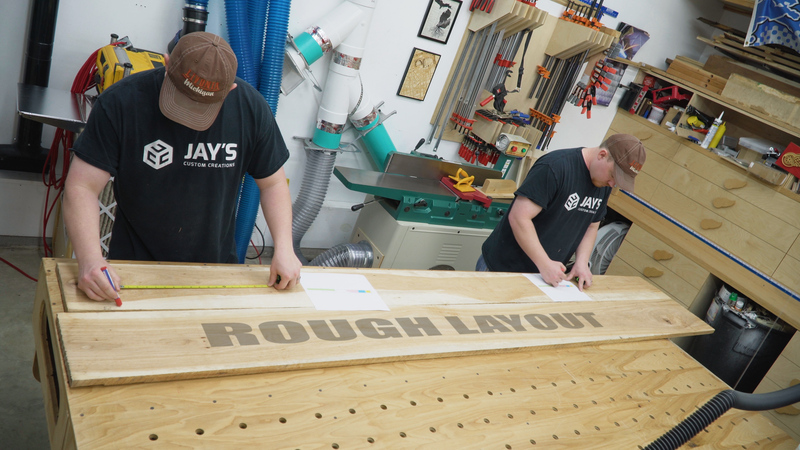 When completing the cut on a table saw a larger piece can sometimes shift into the blade because the material you removed may have been supporting the rest of the piece above the table. 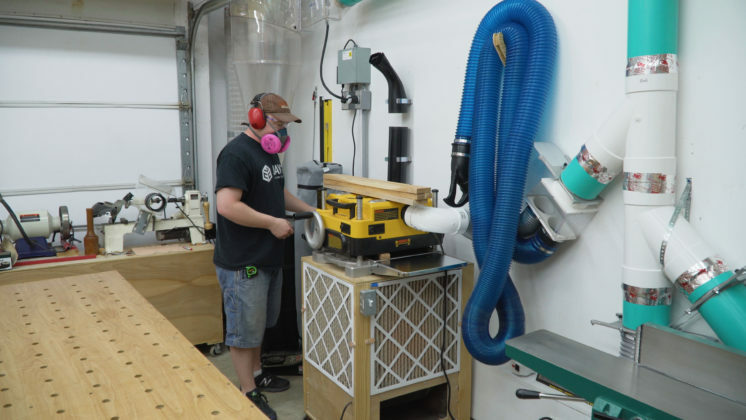 In this case the board wasn’t incredibly bad and probably could have been cut at the table saw but given the option I tend to choose the bandsaw. 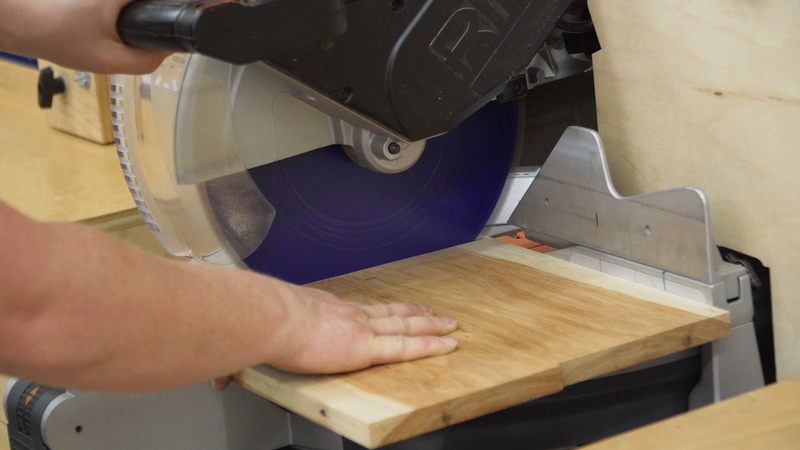 With all of the pieces cut to rough length and rough width I started milling them square at the jointer. 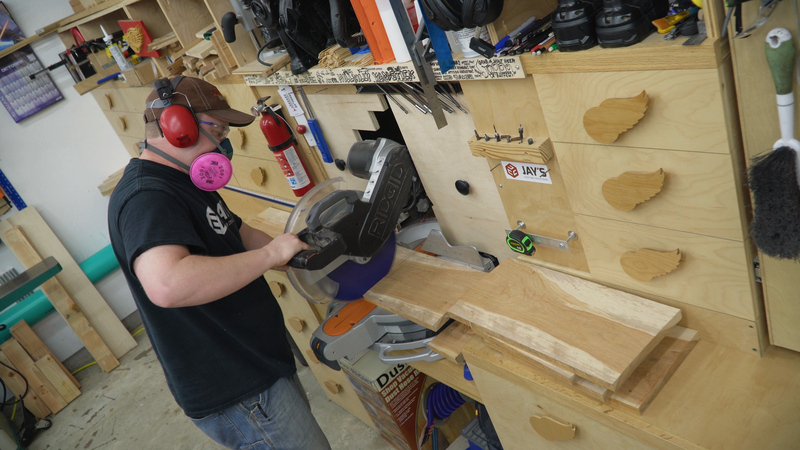 I sized my widest piece to be the full width of my jointer. After one wide face and one short face were jointed flat and square everything ran though the planer. When milling lumber for a project you often are not shooting for a specific thickness dimension. What’s more important than a specific number is that all of the pieces are the same thickness. In this case they all ended up being 3/4” thick. Then all of the pieces are ripped to their final width at the table saw. I didn’t have a board wide and flat enough for the top piece so I made my own by gluing two together. Sometimes this is beneficial because it can give you more options to make the top look exactly how you want. In this case I wanted to end up with a piece that had sapwood on both sides. This gives a nice contrast on both sides that your eyes are immediately drawn to. It also looks more naturally occurring than a book-matched panel. 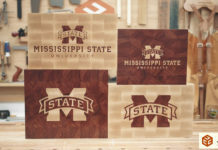 Book-matched panels look great as well but look more placed or fabricated and not naturally occurring. 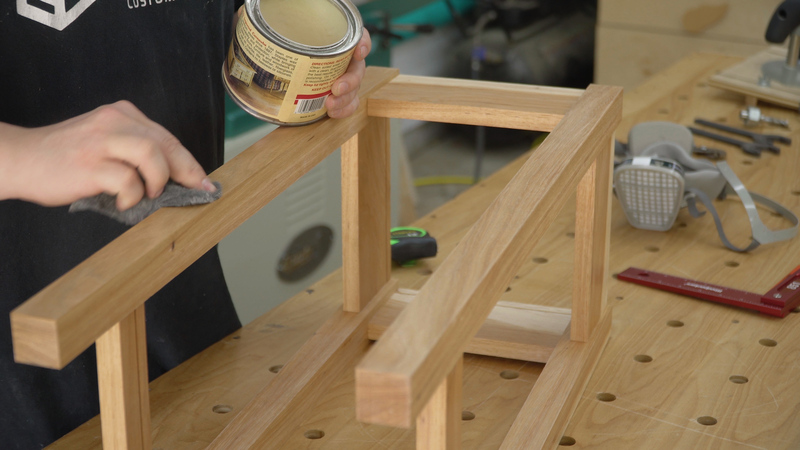 To help align the panel and keep the joint flat during glue-up I used floating tenons. 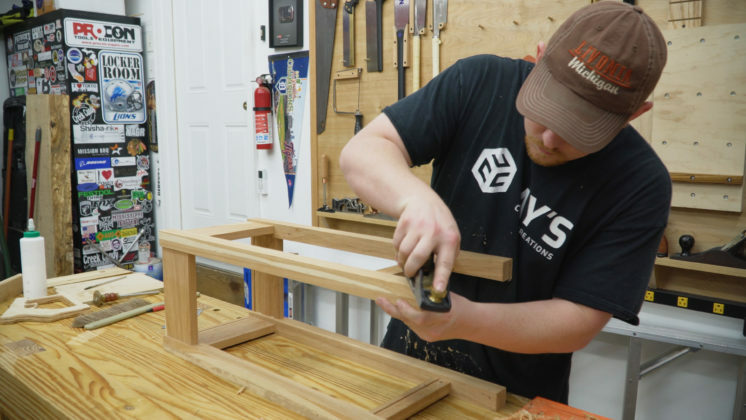 Dowels, biscuits, or pocket holes can also be used. Whichever is more convenient for you. While the top is in clamps the legs are now dry enough to be removed from their clamps. The milling process was the same for these so I’ll skip that. 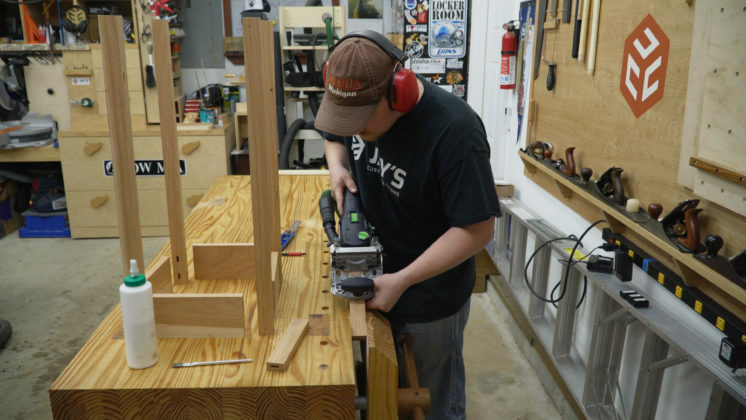 Then it was back to the miter saw station to trim one end and then cut the legs to the same length with the help of the stop block. 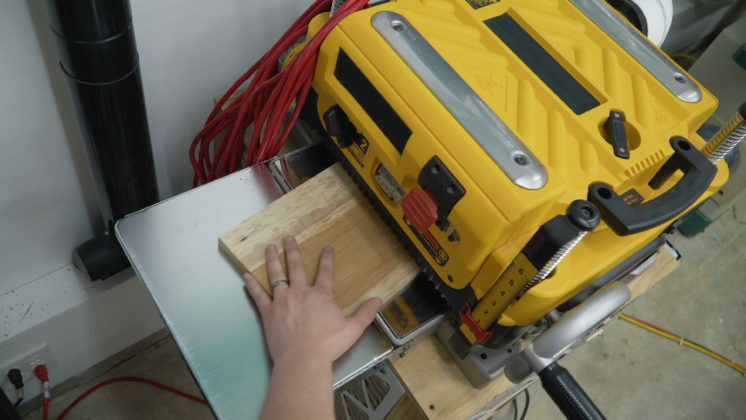 For greater accuracy and safety I crosscut smaller items with a crosscut sled on my table saw. 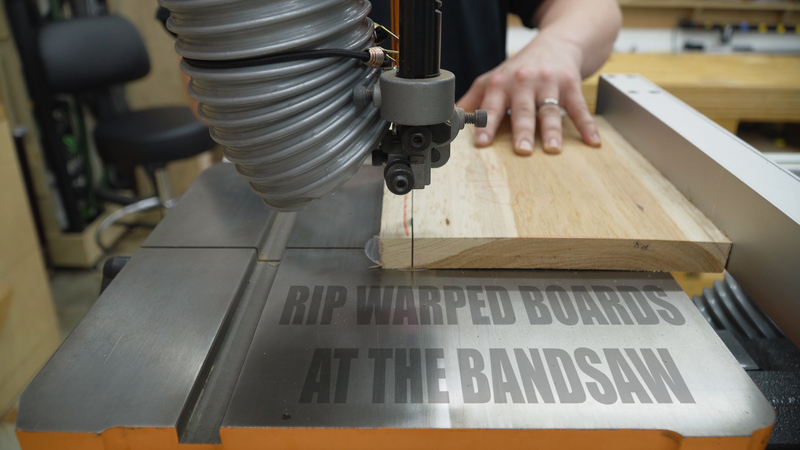 Here I’m cutting the rail pieces. 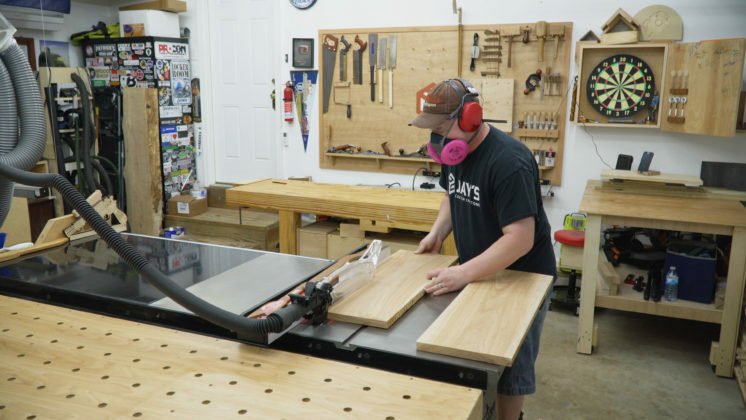 It made sense to keep two of the rails together in the long direction while milling so that they wouldn’t be too short to safely pass through the planer and jointer. Now they can be separated into two pieces. It’s very, VERY easy to get the leg orientation mixed up on a table project. Especially if you are looking for a certain grain orientation on the two most visible legs in the front. To reduce the risk of mixing things up I drew a square on top of the legs to determine the interior corner of each leg and I also wrote a letter to determine which leg goes where. These will never be seen due to the top panel so I used a marker with high visibility. For the rest of the joinery I used floating tenons again. This is all about speed. Use whatever method you have available to you. 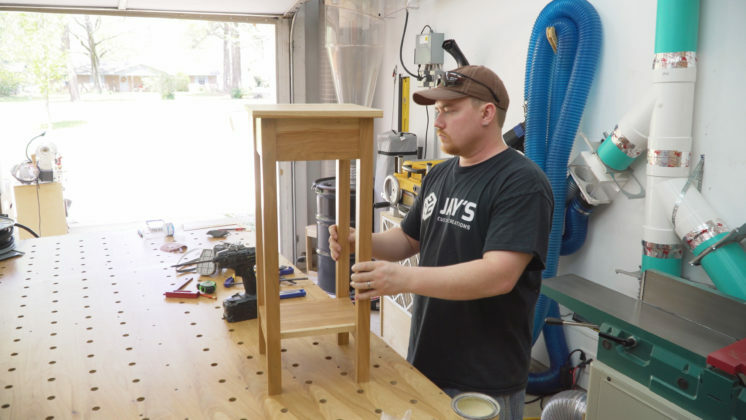 Pocket holes and dowels are both plenty strong enough for a table this size. To suspend the lower shelf I chose to only use two rails. Just two rails gives a slightly lighter and less bulky overall appearance to the table. These also needed floating tenons. Holding them in the vise made the task a little easier and safer without adding extra attachments to the tool. I use table top hold down clips for nearly all of my tables. 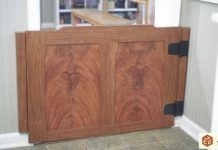 It’s a quick and easy way to attach a top panel and still allow for the top to expand and contract. 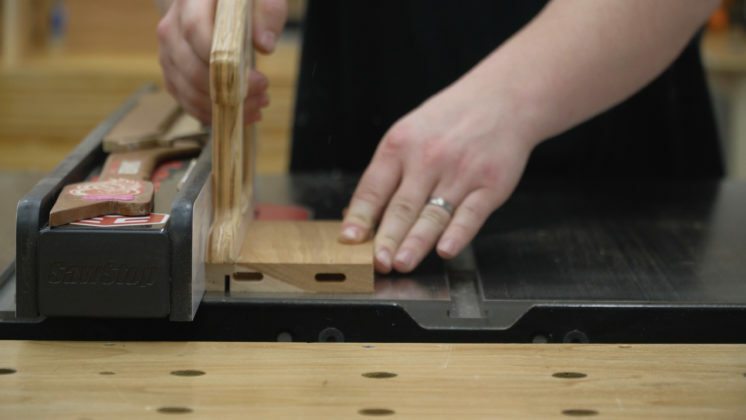 A single saw kerf is needed 7/16” away from the top on the inside side for the clips. I cut this groove on all of the top rails and both of the shelf supports. Assembling the table is pretty easy. 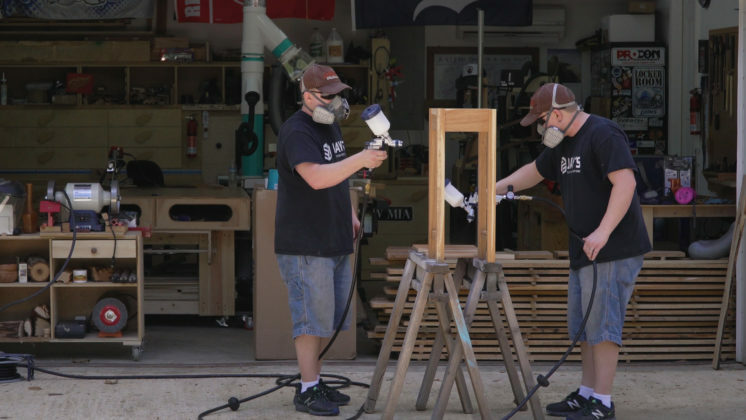 Glue on the tenons and drive everything home. I started by making two side assemblies first. 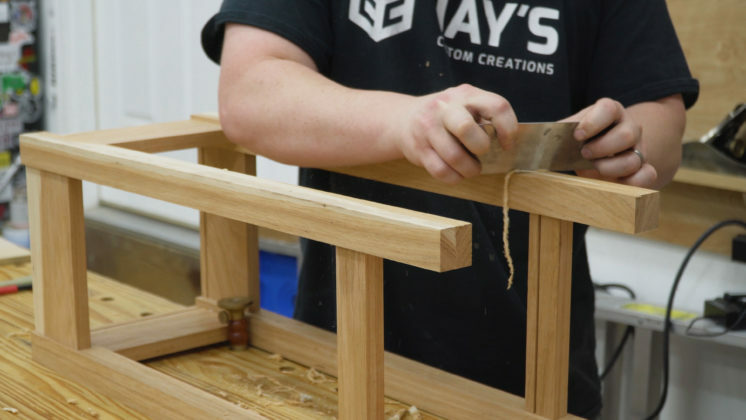 The tenons are tight enough that clamps are only needed to fully seat the joint. Then the two side assemblies can be connected with the remaining rails. Again, using clamps only to seat the joints. After an hour or so I started cleaning up the surfaces with a scraper. 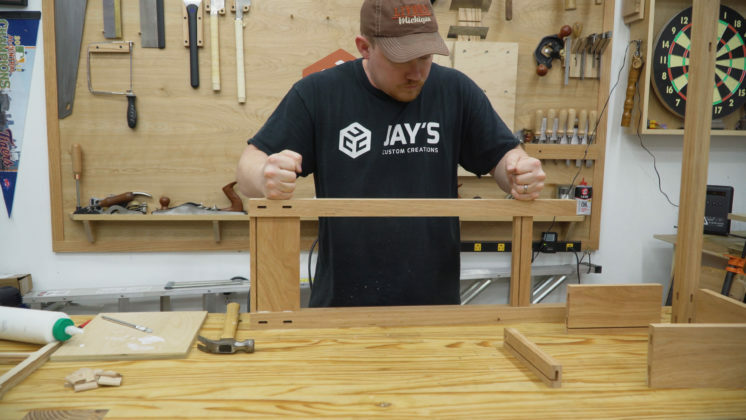 In most projects you can save yourself a lot of headache by doing this before assembly but my pieces didn’t require much work so it wasn’t a big deal at all. 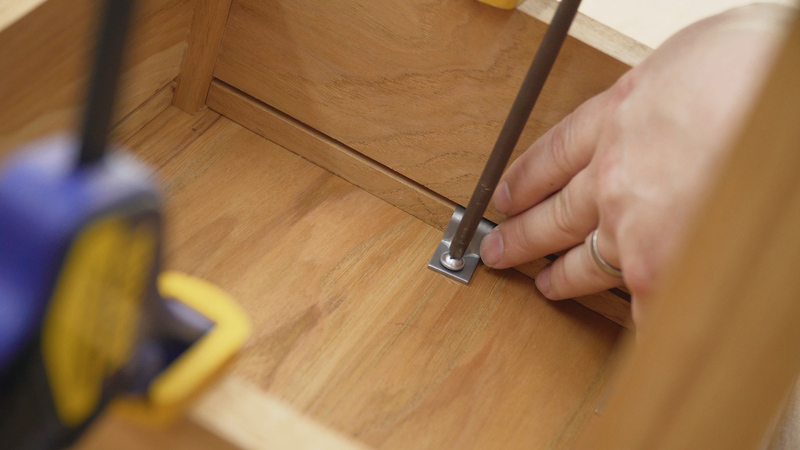 Every table or cabinet or piece of furniture that contacts the floor should have some type if relief cut on the perimeter of the feet. If not you risk a piece of wood breaking out on the trailing side if the item is slid across the floor. 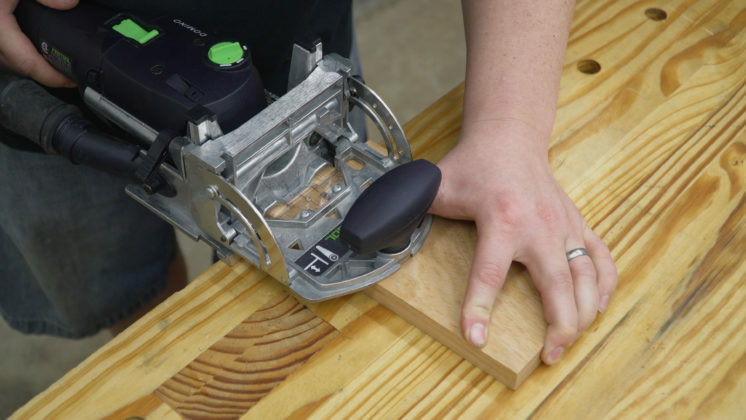 A few passes with a hand plane to create a 1/16” chamfer are all that is needed. After scraping the table top smooth I crosscut it to size with the miter saw. I didn’t want to leave the sharp machined edges on all of the pieces but also didn’t want the added look of a round over or a chamfer. A few passes with a block plane is a happy compromise to make the edges feel a little better to the touch without changing the appearance. 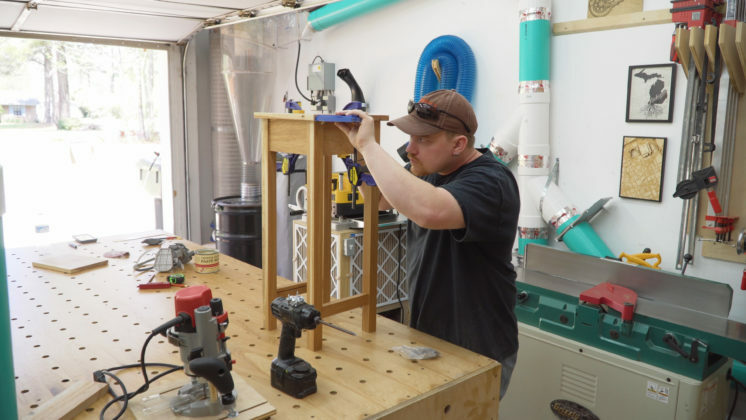 No matter how precise you are, it’s nearly impossible to have a small table sit perfectly flush after assembly. The smaller your table the greater a slight error or misalignment is magnified. This table had about 1/16” of wobble between the legs when checked on a machined flat surface. On a larger piece like a dinging table you would never know. 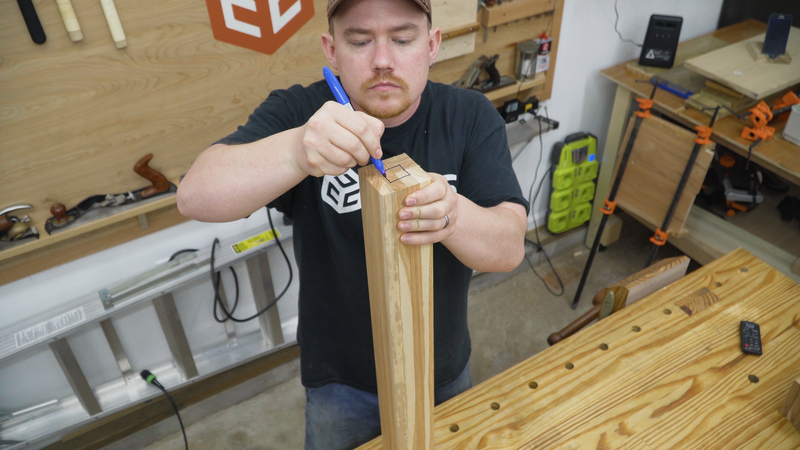 Trimming a tiny bit off without going too far is difficult with power tools. 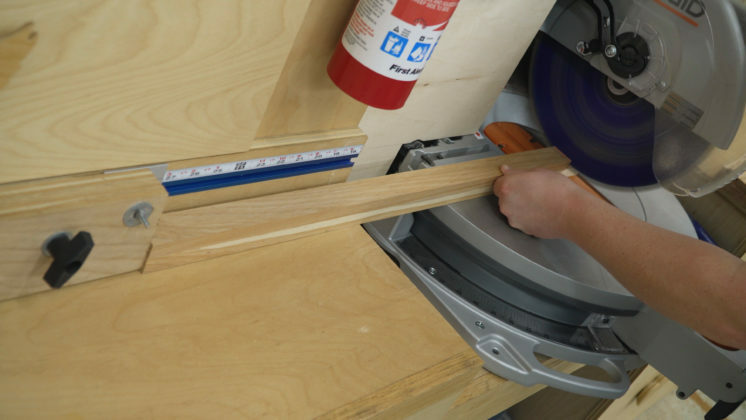 A few years ago I probably would have used a crosscut sled or miter gauge in my table saw to try to remove a tiny bit. 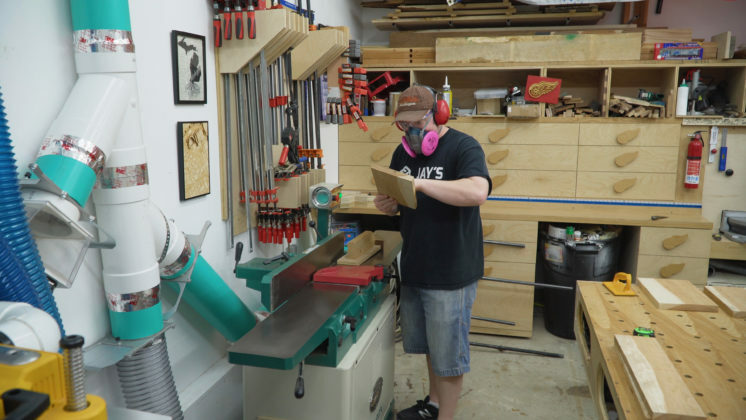 Since starting to explore hand tools a couple of years ago I’ve learned that there are a LOT of situations in woodworking where a hand tool is the right tool for the task in regards to efficiency as well as safety. This is especially true since making my workbench and finally having a solid foundation to use my hand tools on. 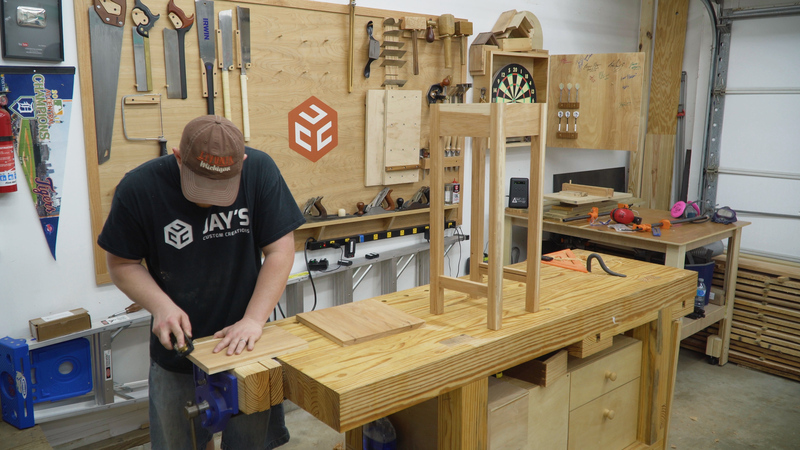 I used my shooting board to remove an even amount from both of the high legs until the table sat flat on the table saw. For a finish I chose to use Minwax Polycrylic. It’s not an outdoor finish but the only outdoor elements the table will face is the humidity in the air. It will live on my north facing porch which is sheltered from the sun and rain all year. After letting the finish cure I used a 220 grit piece of sand paper to remove any dust burrs that were in the finish and then polished to a satin finish with wax and steel wool. This isn’t the normal process I’d use on a piece of furniture going in the house. It’s all circumstantial. If it were going inside I would have raised the grain first with water, sanded that smooth and then applied the water based finish. Finally the top can be installed. After centering it I clamped it in place with a couple quick clamps and verified it was center with a measuring device. The clips I’m using are regular, metal table top hold down clips. They are fast to install and inexpensive. They also allow for wood movement on the top panel. The lower shelf is installed the same way. The last step was to put it on the porch, mark that one item off the honey-do list, and enjoy a picture perfect spring day. I hope you enjoyed the video for this build. If you’re interested in the SketchUp file for this table click here to download it. Have a good one! Nice pink mask. I wear one all day when I’m in the shop. I noticed you were using a finishing wax. Any tips on the application? Seem like I just make a mess every time I try a paste wax. Really enjoy your videos. I just get such a kick out of the ending of this video! 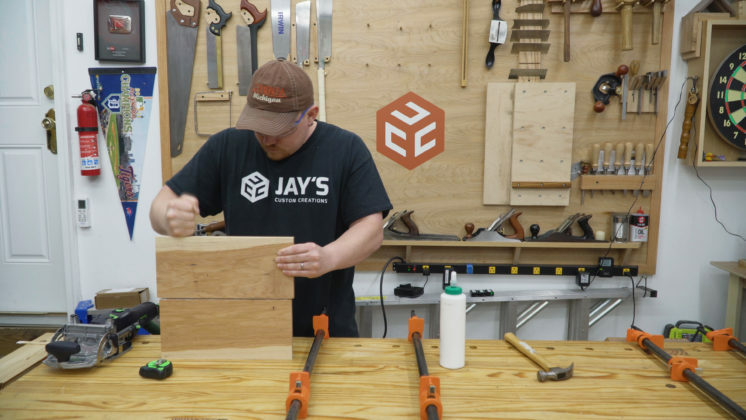 Jay, you do such amazing work with your videos. I really didn’t expect your…um, other Jay to pick up that cup! EPIC! Great job! 100% true on the marriage = honey-do list. Not nearly as sweet as the name might imply. Great vid bud. Hello Jay, It is the same this side of the pond. Our honey-do lists are called ….When you get a minute! The day I got married the Vicar took me to one side before the service and said to guarantee a happy marriage here are two words of advice for you … Yes dear! I really enjoy your videos, thank you for making them, and sending them. 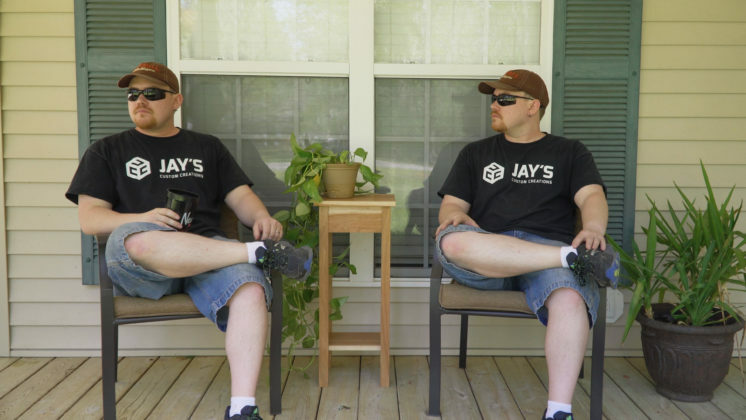 You know Jay, I miss the ‘watching glue dry’ humor you used to use, but this trickery of having the ‘other’ Jay steal your drink was just as good. Nicely done. And this is a perfect project for a beginner!!! I enjoyed your step by step video, especially at the end where you took the drink from your “twin”. Outstanding professional videos. I really enjoyed the hickory side table build. A nice piece of furniture and I appreciate the free plans, but I don’t have sketch up and I was wondering if .pdf plans might be available in the future? 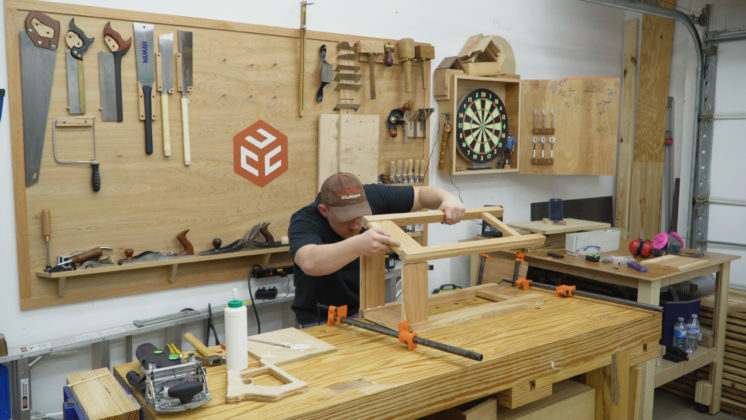 Thanks all that you do for the woodworking community. Thanks Dave. I might go back and make some plans for completed projects including this one.